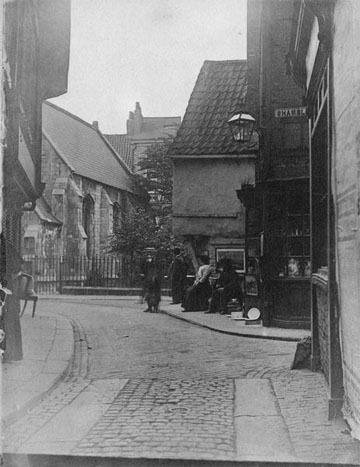 This photo from the City of York Council archives, taken in the late 19th century, shows similar cart tracks and setts. It shows clearly that at that time they stopped at the end of Newgate. The Shambles is off to the right, King’s Square, still with its church, is ahead. All done for ‘the disabled’ — really? The Mail went for this angle and other papers have/will too. I’ve read a lot of info about this proposed revamp and my understanding is that it wasn’t for ‘the disabled’. It was about impressing visitors. The ‘disabled access’ appears to be some kind of weird spin put on things. It’s churned up some nasty prejudice and ignorance in the comments in response, as singling out a group always does. Suddenly the ‘aesthetic’ improvements are the fault of these ‘disabled people’. So let’s blame them then, or health and safety gone mad, or political correctness, or all the other things the story in the Mail churned up. This group ‘the disabled’: who are they exactly? It’s all of us, we’re all ‘disabled’ by something, I’ve lived long enough to know that. And if we’re not obviously physically disabled now we will end up disabled in some way if we live long enough. Less of the ‘us and them’ would be helpful. Do they mean the paving is difficult for people with particular mobility or sight difficulties? I never saw massive complaint from these perspectives in the responses to the consultation on the changes. Yes, the work in King’s Square is a waste of money, in many people’s opinion. And it is removing something which has character and interest. King’s Square is full of other things of significance apart from the paving. Personally I’d really like some more detail on other aspects of the work, such as whether the people who paid for plaques on benches have had a proper say on the imminent removal of those benches, and whether anyone also cares about the imminent removal of a healthy tree. If you have any facts or information to add, please add a comment below. For previous pages on the paving in particular, see here, and this more recent page including other examples of cart tracks and setts. Information on the changes to King’s Square, from City of York Council. Includes image of proposed redesign, as approved by the Cabinet in April, which is now in progress. The work has uncovered the remains of the church. As far as i can tell, the ‘disabled access’ aspect of this work was never more than a secondary point in the original proposal. As the the controversy as grown, the council have fallen back on this aspect as an easy one to defend. This shift of focus does, imo, show that they realise theyve made errors both in their proposal and in their judgement as to just how fond of Kings Square the people of York are. 20th Century York isnt part of the tourist attraction, so is judged to have little value. Those of us who grew up here remember the gravestones from our childhood, remember meeting friends there, remember the rain on the cobbles, eating fish and chips sat on the raised wall, even remember The Clash busking there. That area holds memories. The ‘new’ Kings Square development doesnt respect that, it replaces that fabric of shared memory with a clean, new canvas. Pointlessly. The area could do with a ’spruce up’, but please, a sensitive one. Evolution over revolution please. The ‘re-invigouration’ ( a distasteful, disrespectful, arrogant word in this context ) of Kings Square is an act of destruction. Thanks John for the link, much appreciated. Problem is some people aren’t on Facebook, and it does seem to be asking for a login? I was reading some of the comments on FB with interest. It is though more ‘recent history’ we’re all concerned about losing, I think, not ‘ancient’? The things of value in that square (tree soon to be felled, plaques on benches, curving line of cart tracks and setts) are 20th century or more recent additions (the tree was planted in 2001). It’s too late anyway as this was all approved by the council months ago and as we know much of the paving has already been lifted. Having thought about this for many months I still think it’s all a mistake and a pointless waste of money, and see it as destructive rather than enhancing, but also appreciate that views on this differ. Good article by the way…. 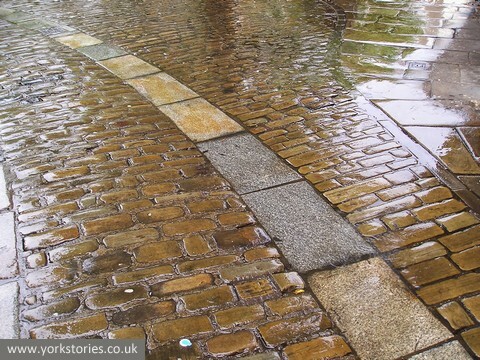 As a wheelchair user I found the cobbles uncomfortable and dangerous (to me and other pedestrians in my vicinity) when wet. So will welcome smooth and ease of access. The Kings Square changes are EXACTLY the same as the demolition of the little bowling green for the Barbican centre-didn’t matter what anybody said, the Council had decided it would go and it went, although it was a totally unnecessary measure. Changing Kings Square is also totally unnecessary, but the Council has decided, so it will/has happen(ed). One day York will be just full of coffee chain coffee shops, the same high street chains as the rest of Britain and will have lost its uniqueness and beauty to political correctness, and massive Council egos. I examined it on Saturday & the brick and cobble with the 2 tire tracks that are smooth extends from the tarmac road, bending around going past the chocolate story. That brick cobble with smooth wheel stones is being removed up to a certain point. That style of road continues on to the shambles but then instead of those tracks going to the shambles they go straight on towards the market. I know we cannot change what is happening now but we can affect the future. We can encourage the council not to waste money like this. We can show our opinion on cobbles in York since they probably have national pressure to remove them for health & safety. And we can show our council how much we care about history. All these are positives. What we need is education on how to find out about future plans and have our say. I only found out about this on saturday. Many York people didnt know until it was in the national newspaper. the point is not when the stone was laid but the design of the stone invokes the imagination of history. This cobble with wheel tracks is not a 1970s road style. Those in the 1970 were making the road look like something from pre 1970s. You can see that they wanted to make a design based on their knowledge of the past. Just like the people at the mister are adding stonework but you cannot say the minster is a modern building. They are using old methods so it is still ancient. In the same way this road was built by 1970s people to depict much further back in history so that people would be able to step into the past. Not into the 1970s but much further back in time. In summary it is not a 1970s road. Just like in the Jorvik centre you could say that Roman village is not a Roman village because its made of plastic. The point is to preserve the past, recreate the past. Look how things were 100s of years ago and if someone in the 1970s restored a look that is 100s of years old why spoil that if people are enjoying that creation & its not causing any problems? Thank you Lisa for your take on both this and the Lendal Bridge saga. Has helped me get abreast of both. Yes, any links to groups/campaigns committed to protecting our built inheritance both ancient and modern would be useful. One’s that don’t require a Twitter/Facebook account especially so for people like me who don’t use social media. Michelle I agree and I’’m sorry if it looked otherwise. If the tracks are a 70s addition then I say well done those people in the 70s for something which has looked good for longer than the Coney St and Parliament St paving has. Just concerned about it being presented as older than it is. Important to clarify though that the King’s Square repaving work is part of the ‘Reinvigorate York’ project, so it has an overall agenda/bigger ‘vision’.